As part of our product review section we try to find products that are not only interesting and good value but that we would also be happy using ourselves (after all why recommend a product you wouldn't or don't use yourself?). 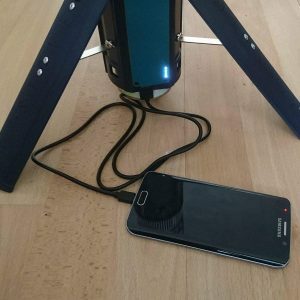 As a social media manager I am (Anthony) always in need of ways to charge my phone and although solar panels and battery packs are good and work very well, they can also take up quite a bit of space. With camping, bushcraft and fishing being firm favourites of mine, I had been looking around at various products and ideas that would save space and weight by combining cooking and device charging. There were several natural fuel stoves that had thermoelectric generators that converted the heat into electric and stored it in battery packs but they were very bulky and due to the natural fuel could be very messy and take ages to cool down. 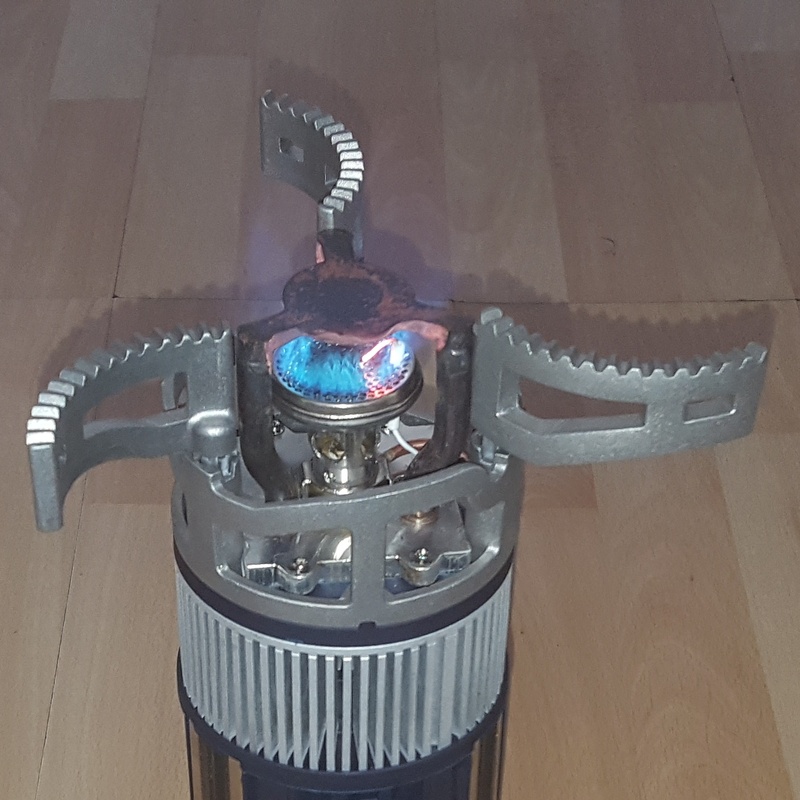 Then recently I came across the TegStove from Togology, it incorporated a thermoelectric generator (TEG) and a gas (STOVE) which used standard butane gas cylinders conforming to EN417. One of the things that got my attention was the built in heating system for the butane gas canister, the reason this was interesting is that when cold standard butane canisters can result in the stove spluttering, not lighting, uneven cooking and wasted gas. A lot of the time this is bypassed by using multi-gas canisters which are a lot more expensive. 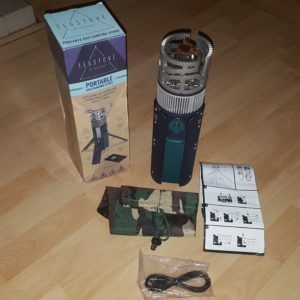 There is also a built in battery pack which you can either pre-charge at home or that will start charging via the high output 56mm thermoelectric generator every time you ignite the gas. The battery pack has a 5v USB socket which will charge phones, cameras, tablets, iPads, gps units, etc with no problem at all. Health and safety has been considered and there will be no blowing yourself up with matches or lighters as it has a built in piezo ignition which lights the gas nice and safely. Okay so apart from the very clever gas canister warming system and the thermoelectric generator charged battery pack, why should you pick this stove over anything else? Well firstly the design is seriously well thought out and looks absolutely brilliant. Once you have resisted (or not) the urge to wave the stove around like a lightsaber pretending to be a Jedi, you can start to look at the practicality of the design. The three legs built into the side of the stove are strong and well built, they also have several settings for locking each leg into place so you can be sure that you will have a stable and sturdy stove to cook on. At the other end the pot supports fold out from around the gas burner not only giving your burner the extra oxygen it needs to give you a steady and consistent flame. They also give a solid support for your saucepan or frying pan. Weighing in at only 1.4kg and conveniently folding away into a cylindrical shape the stove is very light and packs away to a relatively small size it is a easy to store stove and power pack. 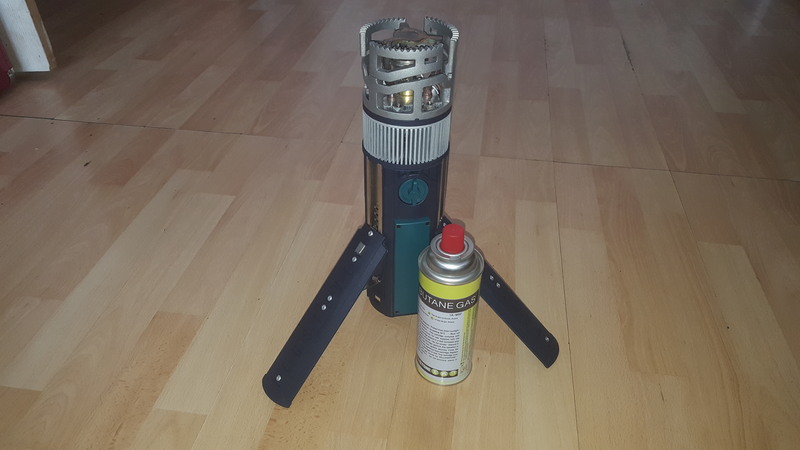 The butane gas canisters are the standard EN417 style so are readily available from most camping shops. You can also see what the team are up to on the TegStove Facebook page. Do you love pizza and fishing?